When the mysteries of Malaysian Air Flight 370 finally become clear, destinations around the world and in China will be left wondering what impact the tragedy will have on the Chinese outbound travel market. Remember, China is new to this outbound travel stuff and the older ones among us remember how a relatively new American market to international travel reacted to the Achille Lauro incident in 1985 that collapsed American tourism to Europe in 1986. Tensions between China and Malaysia, already taut because of the lost jet carrying 150 Chinese nationals, took another blow when a Chinese tourist was kidnapped last week from Singamata island, a Malaysian diving resort off Borneo. Chinese government figures and media have been heavily criticizing Malaysia's response to the missing airline, and Malaysian travel agents report a slump in bookings from China. A slump in bookings from China has become tantamount to devastating for destinations around the world. According to December’s ITB World Travel Trends Report, conducted by IPK International, China is now the world’s number one market in travel spending overseas. It ranks second for total trips and fourth for overnights. In the first eight months of 2013, trips by Chinese travelers overseas grew 26 percent compared to 8 percent for Asia overall. IPK expects the Chinese market to grow 18 percent in 2014. In 2012 Chinese citizens undertook around 45 million trips abroad and spent approximately $84.4 billion. Last April, Chinese President Xi Jinping predicted that the overseas Chinese traveler would reach the 400 million mark. Companies and tourist offices around the world have been altering their products, their budgets and their allocation of such inventory as rooms and seats to accommodate the 800 pound panda in the room. Last August, Hotel.com reported that 75 percent of global hoteliers said that Chinese travelers accounted for 5 percent of their business. According to the Hotels.com report, which surveyed 1,500 hotels, 96 percent of overseas Chinese travel is leisure based. Companies like Hilton and Starwood are now opening Chinese restaurants, putting tea pots in rooms and hiring Chinese-speaking staff. Even Donald Trump, who during his presidential campaign referred to Chinese people with a 12 letter epithet oft-heard on the streets of New York, sees them differently as a hotelier than he did as a candidate. New York’s Trump SoHo created a selection of amenities, services and packages catering to Chinese travelers. Trump SoHo will greet Chinese guests with a special welcome kit, hot/cold towels, and a letter from the general manager in Mandarin. That is one letter, not 12 letters. In January, TRAVELSAVERS Worldwide Independent Network (TWIN) formed a partnership with the outbound China Travel Service. For TWIN it’s a chance to serve the many Chinese travelers who are traveling as FITs. The Hotel.com survey also found that 70 percent of Chinese travelers travel independently. If the same tendencies prevail in China as in the U.S., the Chinese will continue to travel internationally because FITs are less sensitive to acts of terror than group travelers. 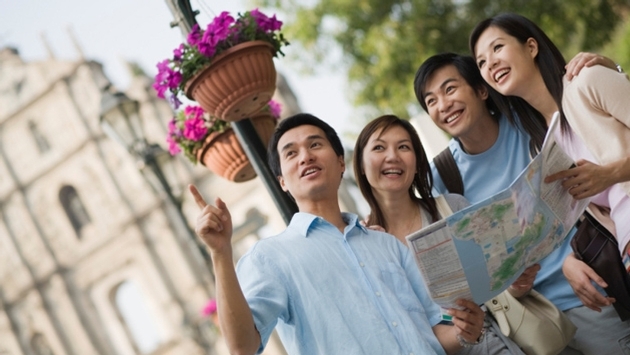 According to VisitBritain, the total expenditure of Chinese travelers in the UK during the first half of 2013 doubled compared to the same period in 2012. Chinese travelers are now the UK’s highest spending Asian visitors. But spending by Chinese tourists is a bit different from the way other travelers spend because shopping is a major activity for the nouveau riche of China. According to Tompkins International, which studies China’s emerging luxury consumer, almost 60 percent of Chinese luxury purchases take place outside the Mainland. No wonder then that Bangkok is building a $267 million Chinese-style market in its suburbs called Sampeng 2 on a 56-acre site with a Chinese architectural design, including a traditional red-tiled roof. It is due to open early next year. Most of the 1,000-plus booths in the market have already been secured in advance by vendors of clothing, footwear, jewelry, home ware and souvenir goods. The merchandise will largely be sourced directly from factories in outlying provinces. Observations about the global impact of Chinese exports have been commonplace for more than a decade, now China is reshaping international tourism, not so much as a destination but as a market. In other words Chinese travel abroad is China impacting the world with its imports and becoming the top priority for destinations around the world. That would be a distinction that the U.S. held once.